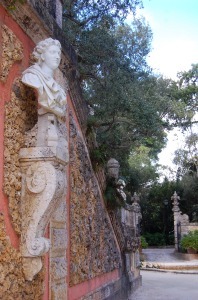 We were visiting Vizcaya. 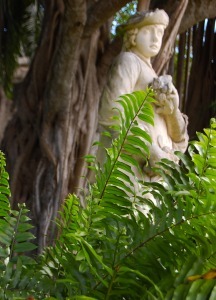 Our taxi turned off a busy Miami highway, near Coconut Grove, onto a quiet, cool, shady lane. We gazed into overgrown foliages lining either side of the winding, graveled road. Sun-bleached and moss laden stone statuary, standing within the native woodland landscape, witnessed the car’s arrival. Our driver said softly “This reminds me of my old country. Haiti.” He was right. It did seem as though we were entering a place from long ago or faraway. 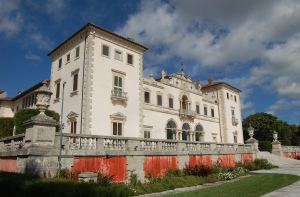 Vizcaya opened in 1916, as the winter estate of American businessman James Deering. This Renaissance Italian villa was built from the Deering McCormick-International Harvester fortune. Architects Paul Chalfin, Diego Suarez and Burrall Hoffman brought Deering’s vision to life. 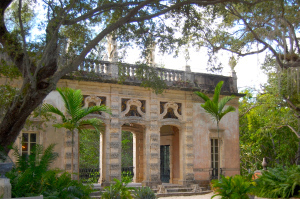 The estate was opened to the public in the 1930’s. Expansive bay-front gardens, lawn pools, gazebo and a ship-like water platform tied the well-manicured grounds to the breathtaking natural views of Biscayne Bay. The house was built around a central, sunlit courtyard. 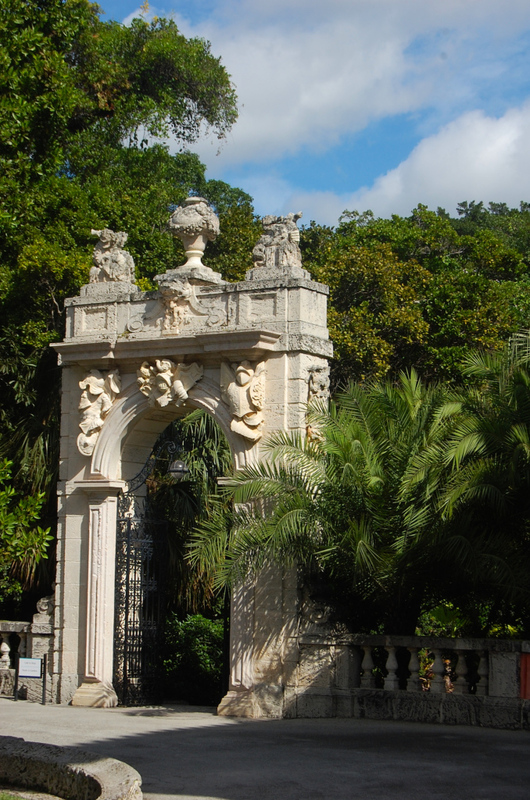 Elegant orchids growing there reflect the timeless beauty one feels when experiencing Vizcaya’s intricate architectural detail. Except for the light-filled courtyard, the ornate interior is somewhat dark and heavy. To escape into the light, one can wander down the back stone steps and into a sun kissed European-inspired garden. 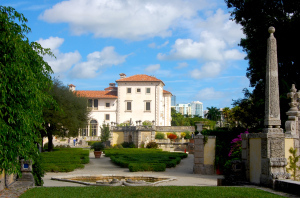 As one looks back for a garden view of the anachronistic house, a glimpse of the modern skyline of Miami can be seen. The juxtaposition of old and new lifestyles comes to mind. 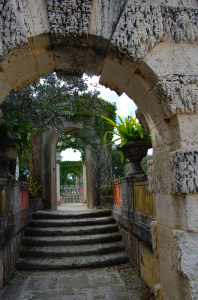 Vizcaya was designated as a National Historic Landmark in 1994. 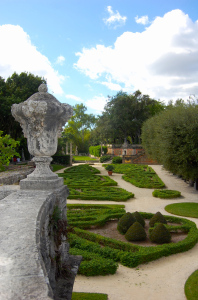 Terraces, garden gates, and flights of stone stairs help a visitor to meander through a variety of gardens to rest amongst the well-placed statuary, fountains and pools. 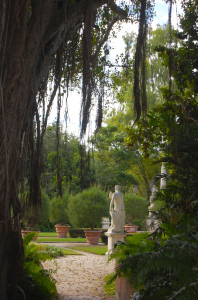 A short walk down the back steps of the villa leads one into a peaceful tree-lined formal English garden. 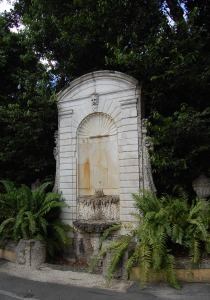 Shallow pools, vine covered gazebos, and time worn statuary graced multiple tiers of shady resting places. 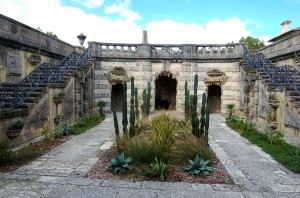 Juxtaposed to the formal gardens lay informal stone covered walks guiding one up wrought-iron stairs passing grottos, and a rough-textured cactus garden along the way. We weren’t the only visitors of the day. 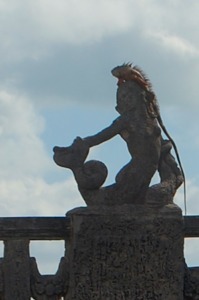 Along with the tourists, a huge Iguana found a nice resting spot in the sun with a glorious view of Biscayne Bay. 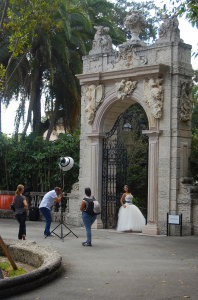 Historic Vizcaya and its fourteen acres of spectacular subtropical setting, formal gardens, sculptures and grottos is a perfect location for a photo shoot, wedding or other elegant event. It’s also a great place to wander through the gardens and reflecting back to a time when life was well-lived in this impressive home. 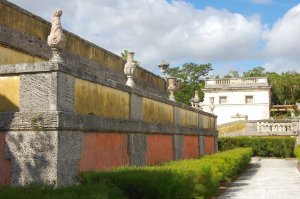 Have you visited Vizcaya or other historical estates? What do you love most about homes from this period of time? Audiences enjoy this floral expert’s floral tips, trends & techniques. Find more design tips, floral products, & ‘People, Places, & Petals’ blog @ sharonmcgukin.com.